Cappadocia, once at the crossroads of the trading world, ancient "Katpatuka" (as it is referred to in antique texts) has evolved itself and now stands at a different meeting point. Where once it hosted the caravansaries of traders from the East and West, it now greets the caravans of the devout and the curious seeking to step back in time. Strabon, a writer of antiquity, describes the borders of the Cappadocian Region, in his 17-volume book, "Geographika" (Geopraphy-Anatolia, vol. XII, XIII & XIV), written during the reign of Roman Emperor Agustus. Cappadocia was described as a very large plateau area surrounded by the Black Sea coast and Pontic Mountains in the north to the Taurus Mountains in the south, and by Aksaray and Lake Tuz in the west to Malatya and the coveted Euphrates valley in the east. Present day Cappadocia is now the triangular area formed by the city provinces of, Aksaray-Nevsehir, Kayseri and Nigde. The smaller and surreal rocky region of the Cappadocia today is the area around Uçhisar, Göreme, Avanos, Ürgüp, Derinkuyu, Kaymakli and Ihlara. Rock Structures; Mounts Erciyes, Hasan and Göllü were active volcanoes in the geological periods. Alongside with many other volcanos, eruptions of these volcanoes started in the Early Miocene (10 million years ago) and have continued until the present day, with Erciyas Dað still considered active. The lava produced by these volcanoes, under the Neogene lakes, formed a layer of tufa on the plateaus, which varied in hardness and was between 100 and 150m thick. Other substances in the layer are ignimbrite, soft tufa, lahar, asy, clay, sandstone, marn, basalt and other agglomerates. The plateaus, having been essentially shaped by the lava from the bigger volcanoes, were continuously altered through the eruptions of smaller volcanoes. 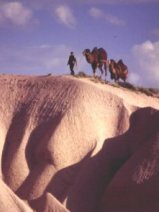 Starting in the Early Pliocene Period, the rivers in the area, especially Kizilirmak (the Red River), and local lakes contributed to the erosion of this layer of tufa stone, eventually giving the area's present day shape. The interesting rock formations, known as ''fairy chimneys'', have been formed as the result of the erosion of this tufa layer, sculpted by wind and flood water, running down off the slopes into the valleys. This water has found its way through the valleys creating cracks and ruptures in the hard rock. The softer, easily erodable material underneath has been gradually swept away, receding the slopes, and in this way conical formations protected with basalt caps have been created. 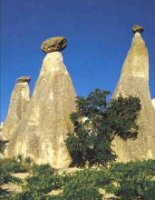 The "fairy chimneys" with caps, mainly found in the vicinity of Ürgüp, have a conical-shaped body and a boulder on top of it. The cone is constructed from tufa and volcanic ash, while the cap is of a harder, more resistant rock such as lahar or ignimbrite. Various types of "fairy chimneys" are found in Cappadocia. Among these are those with caps, cones, mushroom-like forms, columns and pointed rocks. Fairy chimneys are generally found in the valleys of the Uçhisar-Ürgüp-Avanos triangle, between Ürgüp and Sahinefendi, around the town of Çat in Nevsehir, in the Soganli valley, in Kayseri, and in the village of Selime in Aksaray. Another characteristic feature of the area is the sweeping curves and patterns on the sides of the valleys, formed by rainwater. These lines of sedimentation, exposed through erosion, display a range of hues. The array of color seen on some of the valleys is due to the difference in heat of the lava layers. Such patterns can be seen in Uçhisar, Çavusin / Güllüdere, Göreme/ Meskendir, Ortahisar/ Kizilçukur and Pancarlik valleys. For millions of years, the mighty volcanoes of the Central Anatolian Plateau erupted and spewed their mineral-rich contents across the land that would become the cradle of civilization. Blessed with a moderate climate and fertile soil, one of the world's earliest known communities was founded 10,000 years ago at Catalhoyuk along the river banks of the Casambasuyu near Konya. Humankind's first nature painting was found here, portraying the most recent eruption of Hasan Dað almost 9000 years ago. Today, its snow-capped peaks dominate the Konya plain, awash in golden hues where vast wheat fields blend subtly with the ochre-colored soil and the monochrome palette is interrupted only where rivers flow and tall poplars flaunt their greenery. Another great volcano rises in the distance to the east of Hasan Dað. Once called Mt. Argeus, the awesome presence of Erciyes Dað inspired such legends as the "Abode of the Gods," and the Persians built a Zoroastrian fire temple nearby. These two ancient volcanoes mark the eastern and western boundaries of a region known for its curious volcanic landscape, which has been relentlessly carved by nature and by the people who have lived here. 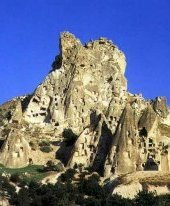 "Fairy chimneys," cones and strange rock formations have been sculpted by Nature's tools of wind and rain while subterranean towns were excavated by a populace seeking shelter from conquerors and would-be conquerors who crisscrossed the wide-open steppes of the coveted Central Anatolian Plateau. Ancient Anatolian tribes, Assyrians, Hittites, Phrygians, Turkish tribes from Central Asia, Mongols, Persians, Syrians, Arabs, Greeks, Romans and Western Europeans have all passed through leaving behind some of their traditions as well as their genes and rendering Cappadocians as exotic as their surreal surroundings. Although the Hellenistic kingdom of Cappadocia once encompassed a much greater area, the name now refers to the region east of Konya that is defined by Aksaray to the west, Kayseri to the east, Nigde to the south and Kirsehir to the north. Guide books and tour buses focus on the underground cities of Kaymakli and Derinkuyu as well as the rock formations and Byzantine churches found within the triangular area bounded by Avanos, Nevsehir and Urgup. For those who take the time to explore the less-traveled byways, Cappadocia is a land rich in discovery. Away from Goreme, Zelve and the major tourist sites, there are partially- excavated Hittite centers, cavetowns and hundreds of churches that are rarely visited, gorges to explore and some of the most vivid, pastoral scenes to be captured in all of Turkey. Aksaray is located on the Melendiz Cayi (Melendiz River) along the old trade route that connected Persia to the Aegean Sea. It was once the city of Garsaura, which was later renamed Archelais, but little of its ancient past survives. During the Seljuk era (1071-1300), Aksaray was transformed into an exemplary Muslim city where a hospital and schools were built. One of the first two Islamic theological schools, the Ibrahim Kadiroglu Medrese was built here in the 12th century. 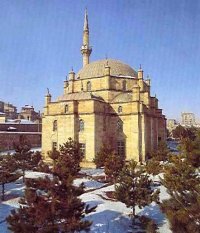 The other was built in Konya, one of Turkey's oldest continuously inhabited cities and the capital of the Seljuk Sultanate of Rum. These and later schools attracted some of the greatest Islamic scientists, philosophers and theologians of the age including Mevlana Jelaluddin Rumi, who came escaping the Mongol invasion of Afghanistan.